1 of 4 Soak 8 bamboo skewers in warm water. In small bowl, blend white vinegar, honey, Dijon mustard, salt and pepper. Add olive oil in a thin stream. 2 of 4 In glass dish, combine 1/3 cup of the dressing with sirloin steak, cut into 1-inch pieces. Refrigerate 25 minutes. 3 of 4 In large bowl, combine red cabbage, sweet red pepper and red onion. Toss with remaining dressing. 4 of 4 Heat grill or broiler. Thread meat onto skewers alternating with 1-inch pieces of sweet red pepper. Grill or broil for 3 minutes, then turn over and grill or broil an additional 2 minutes or until desired doneness. 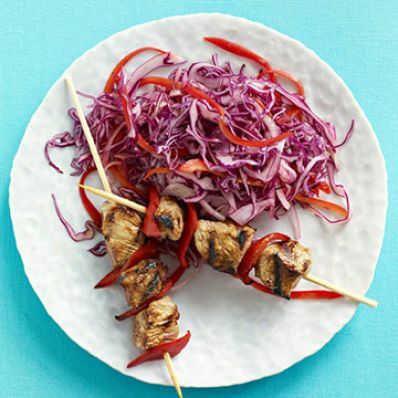 Serve slaw topped with 2 skewers each.